a. This issue has been debated from before the first piano made its appearance around 1859 in the church at Midway, Kentucky, to the present time. b. It was at one time clearly resolved in the church of Christ; however, it has been revived in recent years by those who seek to fellowship at least the conservative wing of the Christian Church and almost all of those who claim to believe in Christ. i. There is some truth to this charge, but the same “old arguments” made for the introduction and use of mechanical instruments of music require no new responses, especially when the old ones have not been answered. ii. In fact, when the only argument in favor is that all of the arguments against are old, it has just been admitted that there are no new arguments in favor and no responses to the “old arguments” against. d. In this lesson we want to look at some of the questions that have been asked on www.thywordistruth.com (they have been grouped as best they can be for this lesson). 2. The real issue – the authority of scripture. a. A woman who has been a long-time member of a local congregation of the church of Christ was reported to have recently said in a Bible class, "I don't see anything wrong with having a piano up there [in worship]." i. It is not clear how many (or few) may feel the same, but some observations are in order. 1. First, the statement uses the wrong standard of judgment. The proper standard is not now, has never been, and will never be what "I feel." When one starts with that standard it is hard, if not impossible to reach a conclusion that does not agree with how "I feel." If your feelings are amiss, your conclusion will be also. Recently on one of the major networks there was a report on counterfeit medicines. There are companies around the world who manufacture such pills (they really aren't drugs). They look exactly like the real thing. They are packaged exactly like the real thing. But they don't work. Some of the counterfeits would not even qualify as placebos. The yellow color in one pill came from yellow lead-based highway paint! While a placebo will do the taker no harm, the little yellow pill gives the taker a disease in addition to the one for which the taker was taking it. One of the illustrations was a cancer patient who was taking a counterfeit cancer pill. The real thing had been prescribed. She "felt" she was taking the real thing. She died "feeling" she was doing the right thing. Feelings are a poor guide. 2. Second, the standard is not now, has never been, and will never be human reasoning. Human reasoning often goes astray because humans often "guide" it to get where they want to go. In short, they do not reason properly. They assume as true facts that need to be proved. They ignore true facts that do not agree with their pre-determined conclusion. The proposition being discussed illustrates such a fallacy. There is a big difference between "I don't see anything wrong with . . ." and the statement "Is there anything wrong with . . . ." When you start with the former the only way you will ever reach the truth is by accident, i.e., your pre-determined conclusion and the truth just accidentally happen to coincide. People who begin by assuming as true that which they are required to prove have committed the logical fallacy of "begging the question." As a result they reject certain arguments because those arguments reach a conclusion different than the pre-determined conclusion with which they began their "search" for truth. One man recently suggested that the church should re-examine "our position" on mechanical instruments in worship, adding that "we are still making the same old arguments that we have always made." He made at least two mistakes. One, the rejection of mechanical instruments in worship is not "our position"; it is Scripture's position. Two, he failed to notice that the "same old arguments" still respond to and defeat the "same old justifications." Since all (except the rankest of advocates) admit that New Testament worship was acapella and that it remained so for centuries, those who advocate the introduction of mechanical instruments have the burden of proof for the change that they advocate. They have never ever met that burden. The only reason that the issue has to be fought over and over is because some of God's people still long to be like the nations round about. Unfortunately, the "pro-piano" people know that time is on their side. Their battle cry now is that the "breach" between the Christian Church and the church of Christ is now 100 years old and that it is time to get over it. They even advocate fellowshipping the Christian Church, or at least the conservative wing. If the breach is to be healed, would it not be better to heal it by a return to admitted New Testament practice? 3. Finally, the fact that one does not see anything wrong with a piano misstates the issue. If the piano itself is the issue, it may seem a small thing to make such a big fuss over. However, the issue is not the piano; the piano is simply the subject matter of the issue. There are many other subject matters that fall into and illustrate the same issue. What then is the issue? The issue is the authority of the word of God! If the word of God can be set aside to bring in the piano, then what other matters can be set aside? The liberal wing of the Christian Church was at least honest enough to recognize that, once the authority of God's word had been set aside, there was no logical stopping place, including the deity of Jesus Christ. Nadab and Abihu thought it was a "little thing" to offer strange fire on the altar of God. Those who know their Bible history know that God did not consider it so small. Leviticus 10:1-2. (Oops! That is an old time-worn argument. True, but it has never been answered!) Moses probably (almost certainly) thought it was "no big deal" when he struck the rock at Kadesh instead of speaking to the rock as God commanded. After all, God intended to provide water for the people and the people got their water. God, however, felt differently. God said of Moses' little change: "And Jehovah said unto Moses and Aaron, Because ye believed not in me, to sanctify me in the eyes of the children of Israel, therefore ye shall not bring this assembly into the land which I have given them." (Numbers 20:12, emphasis added.) With God, it was a big thing because it demonstrated unbelief and a failure to sanctify Him as God. God proved true to the judgment pronounced upon Moses. Deuteronomy 32:49-52.
ii. The true issue has been revealed -- the authority of the word of God. You either bow before the word of God and the God of the word, or you reject Him and His word for your own feelings and desires. You are a free moral agent and have the power to do so. Perhaps such unbelief and failure to sanctify God as God (God's words, not mine) would be without consequences if either you or the god whom you have erected had the power to save you, or if you were perfect and didn't need a Savior. I venture a guess that such is not so. So instead of recognizing your rebellious unbelieving spirit described in the examples of holy writ, you will accuse me of being a narrow-minded bigot who doesn't live in the modern world. It's always easier to blame others. The time will come, however, when you will stand before the God whose authority you have rejected, and you will have no one but yourself to blame for where you stand in that day. iii. "Who are you to judge," you ask? I openly and honestly tell you that I am no one to judge. I do however point you to the word of God and the God of the word: "He that rejecteth me, and receiveth not my sayings, hath one that judgeth him: the word that I spake, the same shall judge him in the last day. For I spake not from myself; but the Father that sent me, he hath given me a commandment, what I should say, and what I should speak. And I know that his commandment is life eternal: the things therefore which I speak, even as the Father hath said unto me, so I speak." John 12:48-50. 3. Has Scripture authorized the use of a particular type of music in worship unto Him? i. First, there must be agreement on the source of authority. If there are competing sources of authority then there may be different answers, each different answer comporting with a different authority. If there is only one source of authority, then that authority, and that authority alone, controls and settles the issue. The answer given below assumes that only the Scripture is accepted as authority. Thus, all of the preferences (likes and dislikes) of men must be set aside. Likewise, all of the “think-so’s” (one type is just as good as another) must be set aside. All must be governed by a “thus saith the Lord.” The assumption that Scripture is the sole authority is based on a prior underlying assumption – Scripture is inspired by God. ii. Having established authority, we turn to the Scripture and the practice of the early church under the direction of inspired men. While the practice of the early church is not conclusive, it at least gives us some insight into that which they understood the New Testament to teach on the subject. After reviewing the writings of the patristic fathers (men who wrote in the first four centuries after the establishment of the church), Dr. Everett Ferguson (Ph.D., Harvard) concluded in his work, Instrumental Music in Worship, that mechanical instruments of music were not used in the patristic period. Lest Dr. Ferguson be rejected because he is a member of the church of Christ, the same conclusion was reach by Dr. James W. McKinnon in his doctoral dissertation, The Church Fathers and Musical Instruments, Columbia University, Ph.D., 1965. Dr. McKinnon is not a member of the church of Christ. He is a Catholic. However, he did not write his dissertation as a Catholic; he wrote it as a church historian. All honest scholars agree with Dr. McKinnon and Dr. Ferguson. iii. This verified historical fact is significant for two reasons. 1. First, it was done in the first of these four centuries with apostolic approval. The apostles, of course, were, in part, the writers of the Scripture to which we look for authority. 2. Second, it establishes that the second question wrongly places the burden of proof. It is well established that the burden of proof rests on the one who advocates change. Thus, the question should be, “Where in the Bible does it authorize the use of musical instruments in worship?” This question properly places the burden of proof on the one who advocates change from the practice of the early church. iv. Most likely the inquirer has concluded that Scripture does not say in those exact or similar words that musical instruments are not to be used in worship. However, the fact that scripture does not preclude the use of mechanical instruments in worship in those exact or similar words does not mean that mechanical instruments are authorized by Scripture. Scripture contains both generic (general) and specific commands. 1. A generic command authorizes the performance of an act without commanding the manner or method of its performance. The Great Commission is a classic example of a generic command. Scripture commands that Christians “go” into all of the world and preach the gospel. “Go” is a general term that does not specify or command a particular method of going. “Going” may be accomplished by everything from a beast of burden to a jet aircraft, and all have been utilized. In fact, one can stay at home and “go” at the same time by means of air waves or the Internet. It is the “going” and not the method that is bound on the Christian. When one goes, the command to “go” is obeyed by whatever means is used. Any method or means of “going” can be chosen, and, when done by whatever means, the “goer” has faithfully discharged the command of God. 2. A specific command authorizes not only the performance of an act, it also commands or authorizes how the act is to be performed. A classic example of a specific command is God’s command to Noah to build an ark. Not only did God command the ark’s building (generic command), He specified the type of wood (specific command) that was to be used in its construction – gopher wood. Because God specified the type of wood, Noah was not at liberty to use any other type of wood. The use of any other type of wood would have been sin. This principle is still true – no specific command of God can be changed (added to or taken away from) without committing sin. Those who reject this principle would have had great difficulty in objecting to the Jews’ sacrificing a Passover pig instead of the Passover lamb that God had specified. b. What then does the scripture say about music in worship? 1. (Eph. 5:18-21) "And be not drunken with wine, wherein is riot, but be filled with the Spirit; speaking one to another in psalms and hymns and spiritual songs, singing and making melody with your heart to the Lord; giving thanks always for all things in the name of our Lord Jesus Christ to God, even the Father; subjecting yourselves one to another in the fear of Christ." 2. (Col. 3:16) "Let the word of Christ dwell in you richly; in all wisdom teaching and admonishing one another with psalms and hymns and spiritual songs, singing with grace in your hearts unto God." ii. Both of these passages command a specific type of music – singing. When God by inspiration commanded a specific type of music, all other types, including mechanical instruments, were excluded. Mechanical instruments are no more appropriate in worship under the New Testament than a sacrificial pig in the Passover would have been under the Old Testament. 1. The Greek language support this conclusion. b. Advocates of the use of instrument in worship contended at one time that the use of the instrument was inherent in the Greek word. c. That argument fails because if the instrument is in the Greek word translated “sing,” and if each participant is commanded to “sing,” then to obey the command each participant must play an instrument. 2. Even our language supports this conclusion.“ IAcapella means “as in the chapel.” The music of the church was a capella for centuries. The first organ was introduced in worship by Pope Vitalian I some 670 years after Christ. When it threatened the division of the Catholic church it was removed. However some 130 years later it was again introduced, this time successfully though there was still some opposition. The Greek Catholic Church refused it and still refuses it. 3. It did not make its way into the Reformation without opposition. iii. Finally, God is not worshipped with men’s hands as though he needed anything. 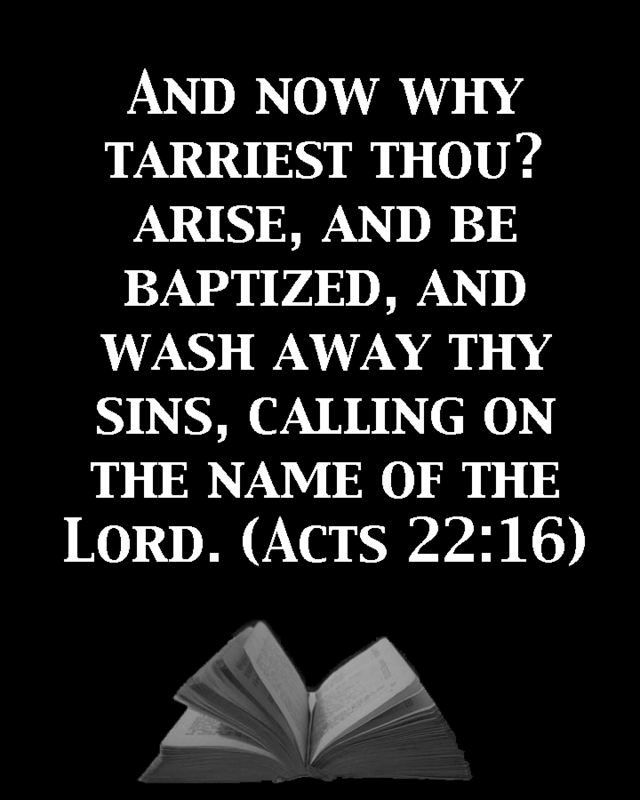 Acts 17:24-25. 1. The God who made heaven and earth and all that in them is doesn’t dwell in temples made with hands (by man). 2. Neither is he worshiped with men’s hands (that created by the hand of man). 3. Mechanical instruments are made by the hand of man; God desires to be worshiped with the instrument that he created – the voice of man. 4. “By him therefore let us offer the sacrifice of praise to God continually, that is, the fruit of our lips giving thanks to his name.” Hebrews 13:15.
a. The context of Eph. 5: and Col. 2: is the daily life of a Christian. It has nothing to do with worship or the worship service. Paul was not admonishing them to avoid immoral conduct in worship. i. Among the issues discussed by Paul, however, is the matter of that with which the Christian is to be and not to be filled. The Christian is not filled with wine, but is filled with the Spirit. 3. 3). Submitting to one another in the fear of God. 3. our attitude toward one another. iv. Although the discussion is not as complete in Colossians 3, the same result emanates from being filled with the word of Christ. v. If these verses do not include the worship through reference to singing, one must then answer where the Christian is to obey this injunction. 1. Does our inquirer sing to his family at the dinner table? 2. Does he sing to his fellow Christians in the parking lot? 3. It will not do for him to say that he teaches and admonishes them in song in the worship service because, since according to him the injunction has no application to the worship service, he cannot obey it there. 4. Of course, one of the inquirer’s difficulties is applying the word “command” to these two passages. Whether it is a command or not does not change the application. It governs all singing done in worship to God whether in the assembly or elsewhere. One could argue that if it does not apply to the assembly, the one who does not practice it elsewhere is not filled with the Spirit. 5. After checking five commentators, none of whom was a member of the church of Christ and each of whom applied the passage to the worship assembly, no more were checked. 6. This argument is made not only by those who seek to justify the use of mechanical instruments in worship, it is now being made also by some who, though they have no problem with acapella worship and may even prefer it, are seeking to justify error so they can fellowship it. This is the same open door through which those who became the modern Christian Church (Disciples of Christ) departed long ago. This rejection of the authority of Scripture led them to their present position in which they, at least in part, deny the deity of Christ and the inspiration of Scripture, among other things. Once again we learn that those who refuse to learn from history are bound to repeat it. b. Musical instruments (the harps of God) will be in heaven. i. An old issue is raised that mechanical instruments are appropriate in the church on earth because harps are mentioned in Revelation 15:2. 1. Additional passages could have been mentioned, i.e., Rev. 5:8-9 and 14:1-3. 2. This argument has been addressed numerous times over the years and most have recognized that its logic will not bear examination. a. First, what is a “harp of God”? Whatever it is, most folks who use it to justify mechanical instruments in worship aren’t using the harp, but instead are using everything from guitar, piano or organ up to an entire orchestra. Since the earth and all things in it are to be destroyed, 2 Peter 3:10, what leads to the conclusion that God’s harp is an earthly harp? Clearly that which is described in Revelation is described in terms that we can understand. This requires the use of earthly words and phrases because that is all that we can understand. b. But more to the point, on what basis do we conclude that all that is described in heaven or that exists in heaven is appropriate for the worship of the church? Most likely those who so conclude pick out of Revelation only those things that they like, such as a harp, be it real or figurative, and leave the rest, such as the bowls of incense. a. That, however, is how they sounded. c. In fact, singing is what they were doing in each passage in Revelation that mentions a harp. d. Is the heavenly harp the only thing in heaven that is earthly and physical; is a literal harp the only thing that survives the great conflagration at the end of time? 4. Those described in Revelation are not a church of Jesus Christ. They are not an assembly of Christians worshiping God here on earth during the Christian dispensation; nothing that they do can properly be cited as an example governing the worship of such as assembly of Christians. c. Musical Instruments were used in the Old Testament. i. This attempted justification for instruments of music in the worship of the church is just the opposite of the justification based on Heaven -- one looks forward and the other looks backward. "Cafeteria" Old Testament selection (picking only that which appeals to you) is no justification at all. On what basis is the use of instruments pulled forward while animal sacrifice, burning of incense, and going to Jerusalem are left behind? ii. Additionally, the Prophet Amos tells what God thought of such even in the Old Testament. Amos pronounces woe upon those who are at ease in Zion, and in the list of those guilty he includes those “That chant to the sound of the viol, and invent to themselves instruments of musick, like David.” Amos 6:5. As in divorce, God suffered some things among those who did not have the Light of Christ. 5. Must the songs that we sing be scriptural in content? a. It is not unscriptural to use words that are not found in the Bible. i. The answer to that question must also be “no,” with one caveat. No one contends that worship in the study of God’s word (often called a “sermon”) is limited to the use of words found in scripture (by which I assume the inquirer means words taken directly from scripture in the same arrangement, i.e., the reading of scripture). ii. In fact, if we must use the exact Biblical words as found therein, would we not by the same logic also be limited to the Greek? iii. HOWEVER, IN NEITHER SERMON NOR SONG IS THE USE OF WORDS THAT TEACH THINGS CONTRARY TO SCRIPTURE JUSTIFIED OR AUTHORIZED. iv. In worship in song we teach and admonish one another (Col. 3:16). ALL TEACHING, WHETHER SPOKEN OR SUNG, MUST BE IN HARMONY WITH GOD’S WORD. b. Examples of unscriptural songs. i. We may not always agree on whether a song is scriptural or not, but we should not assume that songs are Biblical when many, if not most, are written by denominationalists. 1. Indeed, many of the modern songs must be reviewed carefully because much “loose language” has slipped into our vocabulary, especially in regard to the work of the Holy Spirit (the subject of one of our classes). 2. No disagreement can be resolved without a clear statement of its basis; no disagreement can be resolved with rancor. That said, it is not likely that all disagreements will ever be resolved. Now to the songs. 1. Shine, Jesus, Shine. This hymn asks Jesus to send forth His word when he has already done so in the Great Commission. Will he be pleased when we ask Him to do what He has commanded us to do and relies on us to do? 2. One inquirer regarded “Just A Little Talk With Jesus” as scriptural, but did not address the objections made which are: 1) it speaks of praying to Jesus and 2) it suggests salvation by the sinner’s prayer. Neither of these is biblical. a. Certainly Christianity calls for a prayer life, but those prayers are to the Father in the name of the Son, not to the Son. b. The bible does not contain the so-called “sinner’s prayer” and does not teach that it is the pathway to salvation; the alien sinner, i.e., the one who has never become a Christian, must hear the word of God, believe and confess that Jesus Christ is the Son of God, repent, and be immersed for the remission of sin. c. In conclusion, we are agreed on the necessity of prayer, whether it is called prayer or a “little talk.” Hopefully we can agree that that prayer should be offered to the Father in the name of the Son. If so, this song suggests the wrong path for prayer. 3. The same enquirer defended “He Lives,” saying that he “felt” it was fine and that he “felt” Jesus in his heart. a. The fact that one feels a certain way about Jesus’ being alive does not make it so any more than Jacob’s thinking that Joseph was dead made it so. b. Moreover, faith is not based upon feeling because feeling does not determine truth. c. Jesus resurrection is not based on feeling – it is based on fact; it was not an event in the heart – it was an event in history. d. There are many in the world who neither believe nor feel that Jesus factually and actually arose from death. i. If feeling is a proper basis for faith how can you argue with their feeling-based (dis)belief? ii. Jesus lives not because you feel so; He lives because by the power of God he was literally, actually, factually, and historically raised from death and came forth from the tomb. iii. This historical fact was attested to by many witnesses. iv. It can be denied by disbelievers, but it has greater attestation than any fact of ancient history. e. That great fact of history began to lose credence in modernism, specifically neo-orthodoxy, due to the impact of Darwinism. f. Many liberal theologians began to clear the supernatural from scripture because they were impressed by Darwinism’s denial of the supernatural and his insistence that, if God existed at all, He was totally transcendent (as in Deism or Gnosticism; Pantheism accomplishes the same result though it believes that god is totally immanent, and not transcendent at all), never intervened in the world, and acted in nature only through natural law if He acted at all. g. They wished to retain what they recognized to be biblical teaching, e.g., the resurrection of Christ, but they wished to harmonize it with naturalism or materialism. h. Two leading proponents of this new (neo) orthodoxy were Karl Barth and Rudolph Bultman. iii. Their position is that Jesus lives, but he lives only in the heart of the believer – he was not literally raised bodily from the tomb. iv. The song “He Lives” is neo-orthodoxy through and through. v. To assert that he lives within my heart is to fall far short of the teaching of the New Testament. Low in the grave he lay, Jesus, my Savior! Waiting the coming day, Jesus my Lord; Vainly they watch His bed, Jesus, my Savior! Vainly they seal the dead, Jesus my Lord; Death cannot keep his prey, Jesus, my Savior! He tore the bars away, Jesus, my Lord; Up from the grave He arose with a mighty triumph o’er His foes; He arose a Victor from the dark domain, And He lives forever with His saints to reign; HE AROSE! HE AROSE! HALLELUJAH! CHRIST AROSE!